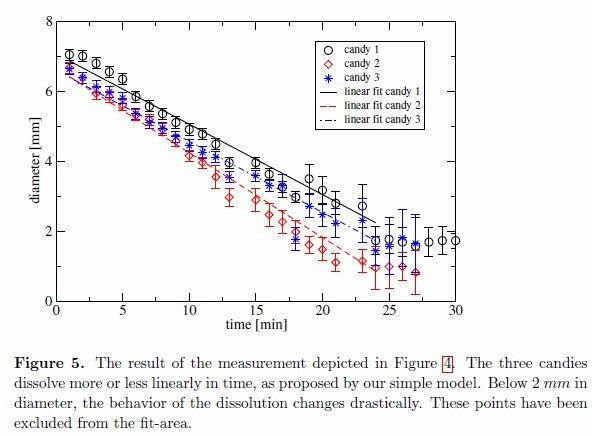 With the Ig Nobel Prizes just around the corner, there's at least one more entry worthy of consideration: research on the physics of maximally satisfying candy consumption. Yesterday, a team of Austrian physicists posted a preprint of their research paper titled, "Sticky physics of joy: On the dissolution of spherical candies." Don't be fooled by the title, however; candy physics is serious business! As the authors note in their abstract, "Serious questions on the optimal strategy of enjoying a candy will be addressed, like whether it is wise to split the candy by breaking it with the teeth or not." Read on for some curious confection physics. Image Courtesy of exper via flickr. For their research study, Andreas Windisch from the University of Graz in Austria and his colleagues first developed a physical model for the disintegration of candy. They wanted to model the decrease in candy mass over time to find ways to minimize this disintegration. Assuming a constant density for the candy throughout the gormandizing process, the researchers could express the candy's mass as a function of time. While the mass decays exponentially under the researchers' simple model, the radius decays linearly. In other words, the radius of the candy gets smaller and smaller at a constant rate. After developing their model, the researchers naturally tested it against experimental evidence. Unfortunately for the research team, they decided not to test the candy dissolution process on themselves. Instead, they dissolved the candy over time in a water bath while periodically taking photographs to measure the candies' radii. Image courtesy of Windisch et al. via their arXiv article. Their model passed the test — for the most part. Once the unspecified candies reached a certain point, however, the radii no longer dissolved at an approximately constant rate. The researchers contacted the candy manufacturers and discovered that the candies' denser cores were to blame. If you want to make your candy last, the authors advise you to maintain a spherical shape as long as possible. Of all three dimensional shapes, spheres have the smallest surface area to volume ratio. Additionally, surface area drives the dissolution of candy: the larger the surface area, the faster the candy disintegrates. Combining these two facts suggests that you should keep you candy spherical to make it last longer. That's why breaking a candy into several pieces makes the experience last shorter. Your saliva can dissolve the candy more easily when there's more exposed surface area. "Even though we now know how candies dissolve in time we stress that the best thing to do when eating a candy is to forget about these considerations, since they draw your attention away from what candies are made for: enjoyment." There's a time for enjoying physics, and there's a time for enjoying candy eating. Apparently, they're mutually exclusive. If you want to keep up with Hyperspace, AKA Brian, you can follow him on Twitter.